"Everyone is entitled to receive this service - not just suspected terrorists, but good American citizens on their union's territory as well as abroad. 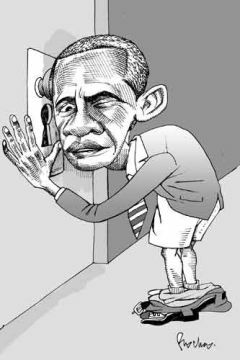 Of course, every non-American on the planet, potential enemies of the United States because they are not American, is also eavesdropped upon. ... This flattered our pencil-pushing egos. We aren't as insignificant as we thought, we said to ourselves, because the NSA is interested in our full stops and commas, stores them, and computes and analyses them." 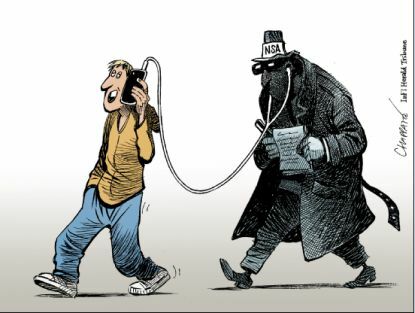 With laudable horror, the Anglo-American press has recently discovered that the NSA (National Security Agency, dubbed 'No such Agency') and other American intelligence services have been spying on telephone communications and Internet messages for several years at least. Everyone is entitled to receive this service - not just suspected terrorists, but good American citizens on American Union territory as well as abroad. Of course, every non-American on the planet, potential enemies of the United States because they are not American, is also eavesdropped upon. This is the PRISM program, put in place by Bush and reintroduced by Obama last December, which allows these breaches of civil liberty. Surprise, surprise ... And such passion! As for us, for a long time, since the long-lost days of the Echelon system, we thought we knew all about the great deeds of the NSA. This even flattered our pencil-pushing egos. We aren't as insignificant as we thought, we said to ourselves, because the NSA is interested in our full stops and commas, stores them, and computes and analyses them. This has been a subject of our writings for quite some time. See one of our older reports, dated June, 2006. It is quite obvious that no one will ever put a stop to this, whatever the righteous indignation of the mainstream press. The data mountain being compiled at NSA headquarters, supplemented by the other data mountains that Google, Facebook, Amazon and others now hold about us, are very much a part of the genetics of the "system." When you dominate the digital networks, why deprive yourself of the data? But how will this data be used? Has the NSA prevented harm from a single serious act of terrorism since it engaged in billions of dollars of investment? If so, it would already be known. What is likely to happen will be quite different. As forecast by our friends, the experts in algorithms, all search functions that now navigate automatically within these programs will from this point on self-activate. People, whoever they are, you and me perhaps, who are in no way terrorists, will be reported with the utmost discretion to other programs responsible for anonymous eradication. A drone, or "special forces" mercenaries, will take care of any necessary eliminations, and neighbors will blame the disappearances on sudden bouts of depression. A general climate of fear (or a landscape of fear) will develop - the kind in which everyone strives to remain as calm as possible. Most importantly, Obama's sleep will therefore not be disturbed.